If you haven’t finalized your Valentine’s Day plans this close to the big day, chances are you’re either very secure in your last-minute logistical skills ... or you’re in trouble. For those still scrambling, Military Times went to the experts: A half-dozen veterans who’ve transitioned into the world of romance writing. Get some intel from their tips below. Need further reading on romance? Click the links to find their latest works. “The best gifts are the ones that make life easier so there’s more time for love, and when you serve in uniform, every second counts,” writes M.L. Doyle, a former Army Reservist who now works as a civilian at Maryland’s Fort Meade when she’s not writing romance novels, mysteries and memoirs. “Try a year’s worth of boxed meals so dinner isn’t a chore. Give gift certificates for Uber or Lyft so driving everyone here and there doesn’t eat into an already tight schedule. And I don’t know a single woman who wouldn’t jump for joy if given a year’s worth of maid service. “Having your sweetheart on duty on Feb. 14 is a blessing in disguise, as you’ll be able to take a rain check for a romantic night on the town and instead take it on an evening that is not plagued with Valentine’s Day crowds,” writes Megan Westfield, whose five-year stint as a naval surface warfare officer included a deployment to Iraq with an Army unit. “He’s never been the sentimental type,” writes Scott, now a professor at the U.S. Military Academy. 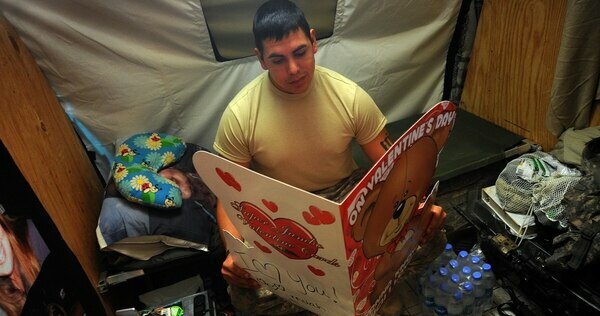 “The first Valentine’s Day he was deployed, he sent me an email with the subject line: ‘happy valentine’s day.’ It’s the middle of the night but I was constantly checking my computer looking for emails from him. “When my husband and I were dual active-duty spouses, the best romantic gifts we gave to one another on holidays like Valentine’s Day were quick overnight trips that also gave us more appreciation for wherever we were stationed,” writes Geri Krotow, a Naval Academy graduate who left service as a lieutenant commander in 1995 and published her first romance novel (of 20, including five due out this year) in 2007. “When you have a sweetheart who works for a DoD or DHS agency, having flowers delivered to her place of work is not as simple as handing her office address to the florist,” writes Westfield, whose second novel, “Leaving Everest,” drops Monday. “But it is still possible, and that extra effort makes it all the more romantic! Her situation would become the plot of “Forgive and Forget,” the first book in Ashby’s “Love in the Fleet” series.